Our mission is to provide our customers with a high standard of product and service to meet their individual needs. 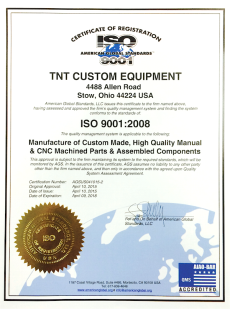 TNT CUSTOM EQUIPMENT is a full service machine shop with fabrication and assembly capabilities ranging from manufacturing small, intricate, and precise single or short run parts to large, complex, and fully automated assemblies. We offer a distinct advantage to the customers we serve – highly reliable parts machined by qualified personnel experienced in all aspects of the machining and assembly business. Our staff is highly trained and continues to improve their skills to be among the best in the industry. Our facility is prepared to meet your machining, fabrication and assembly needs. Our 45,000 square foot building is conveniently located just off Route 8 in Stow, Ohio and is equipped with nine cranes – including three 20-ton and four 10-ton cranes. Click here to view our full equipment list. Our services range from making single parts to full stocking programs for all your part needs. We have the experience from rebuilding worn parts to save on downtime to completely new parts made to OEM specifications to keep your equipment running like new. For more information on our service spectrum, please view our capabilities page. We welcome the opportunity to apply our expertise to meet your needs. We look forward to quoting your requirements in the near future. Please, if we may be of assistance to you, feel free to contact us.